[map] [street view] South of I-10 exit 53, south of Patterson Road. Co-located with WPMI-DT, WSRE-DT, WDPM-DT and WMPV-DT; FM stations WRGV, WMEZ and WXBM. AUX: [map] [street view] West of Molino, off Barrineau Park School Road at 4 Star Road. AUX: 40 kW @ 840 feet. 60 dBu protected contour map, from the FCC. [Website] Tribute site highlighting pics and audio from the 1980-1985 period. [Picture] Image showing RDS text display from a Sony Bluetooth portable headset, showing part of the PS (station name) field as well as the scrolling Radio Text field. [Picture] Image showing the HD PAD data for the HD-1 channel, as seen on an Insignia HD portable. 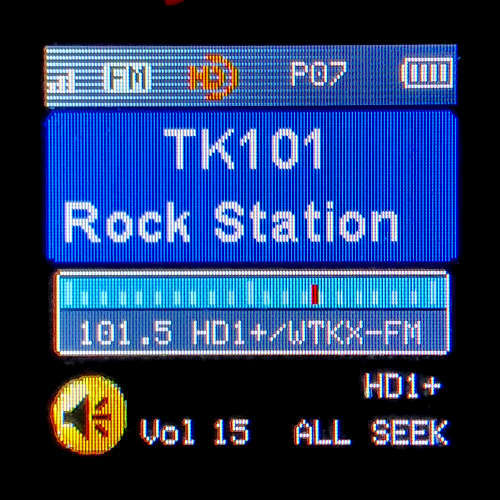 [Picture] Image showing the HD Artist Experience station logo for TK 101. 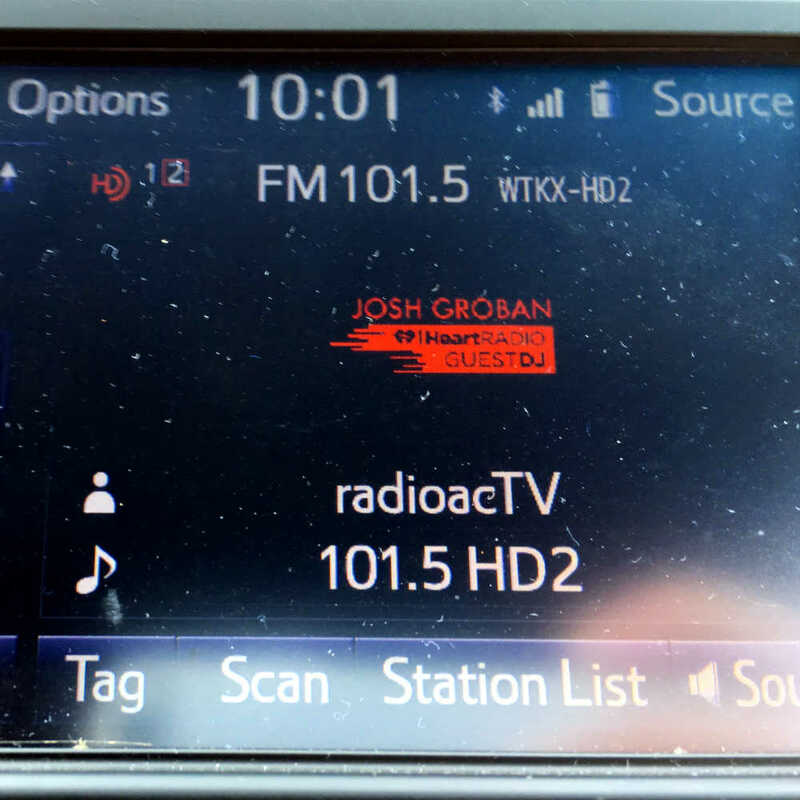 [Picture] Image showing the HD PAD data for the HD-2 channel, which is incorrectly saying RadioacTV when it should represent the Josh Groban artist channel. 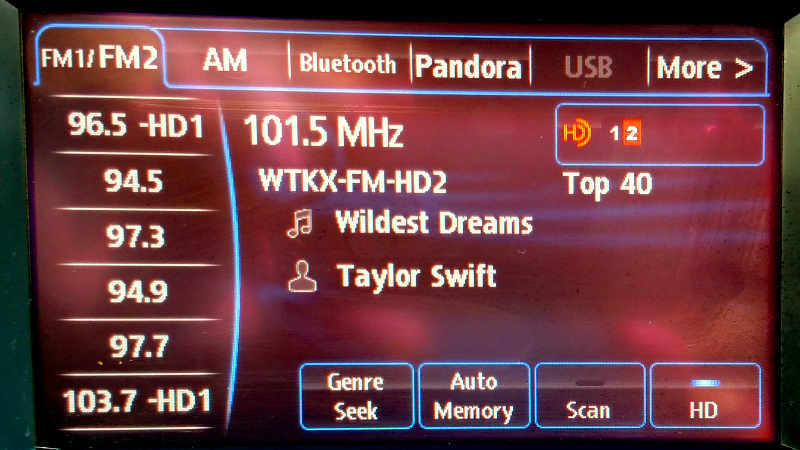 [Picture] Image showing the HD PAD data for the HD-2 channel from a Mazda sedan's radio, with the Artist, Song and Format fields displayed. 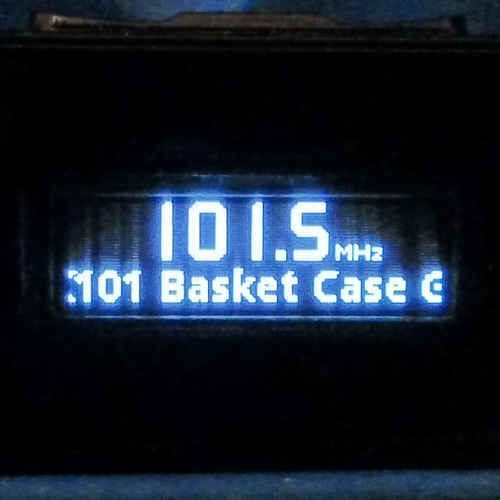 [Picture] Image showing the Artist Experience station logo for the HD-2 channel during the Josh Groban Guest DJ format. [Studio] iHeart Media studios as seen on Street View in Brent. This station dates back to a May of 1968 sign-on as WONF (WONderFul) with a sort-of easy listening format. The station ran 100 kW from the get-go. After just a few years of operation, it was sold to Tri-Cities Broadcasting, owners of black-oriented WBOP AM. This station became WBOP-FM and simulcast most of the time with the AM and its R&B format. The station broke from the AM at the height of the disco craze in the late 70's, flipping to a mix of disco with the WTKX calls. The disco was a fast-burn and eventually went away, and the station went full AOR (album rock) as TK 101. The stations (WBOP AM had moved to 1230 kHz in the early 80's) were sold to Holt Broadcasting in 1986. During the consolidation craze of the 90's, the station went through a few more ownership changes before becoming part of the Clear Channel (now iHeart Media) empire. Prior to December 2013 the HD-2 subchannel carried an alternate alternative music feed, featuring some of the same songs and syndicated programming as the main rock channel, which is more mainstream in nature. 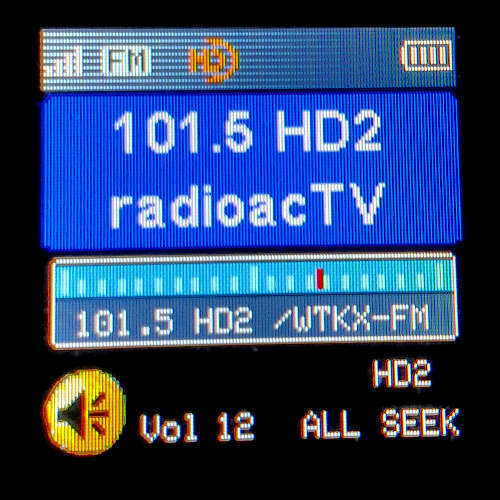 It was observed at the start of December 2013 that the HD-2 has changed to CHR with the iHeartRadio national "radioacTV" format, which is being sponsored by The CW television network. 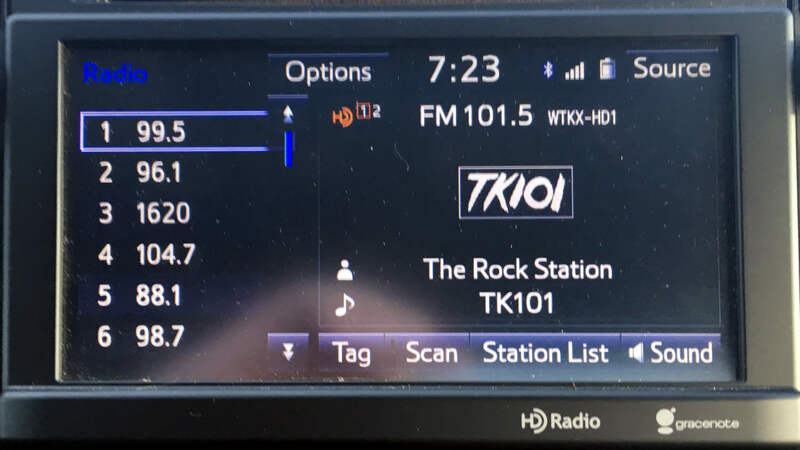 In June 2014 the RadioacTV feed abruptly ended, and classic rock with no liners or promos began being heard in its place both on WKTX and the iHeartRadio RadioacTV stream. It later morphed into the Josh Groban artist experience channel, and as of February 2016 is playing 80's pop music with no liners or promos beyond the required top of hour legal ID. Around Halloween 2016, the HD-2 flipped to an iHeart online "Christmas jazz" format, which lasted until well after Christmas, when it went back to the 80's pop music from before, although it later gave away to a Trace Adkins-programmed country channel in the spring of 2017. That in turn gave way to a Shania Twain guest DJ station in the summer of 2017. That changed to "Ready Player One Radio" in the spring of 2018.